The Thorntree Country House in Klein Karoo, South Africa is the perfect base from which to explore the unique attractions of this area. The Country House is situated on the route to the Cango Caves, the Swartberg Pass and the circle route to Prince Albert via Meiringspoort. 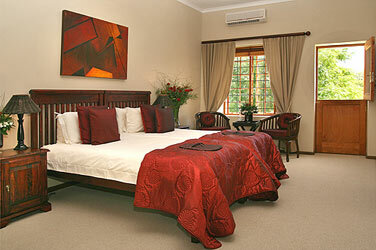 It is also within easy reach of the Cango Ostrich Farm and Cango Wildlife Ranch. 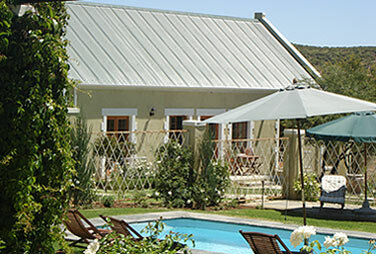 The homestead and outbuildings date back to the 1800's and reflect the typical Klein Karoo architectural style. They have been gracefully restored to their original splendor, and equipped with all modern conveniences. Our dining room reflects our warmth and hospitality, and overlooks the sparkling swimming pool. The picturesque Schoemanshoek Valley provides a breathtaking backdrop. Visitors can expect exquisite Klein Karoo cuisine including our specialty - a trio of fillet (ostrich/beef/game) - a true celebration of local culinary art. The Thorntree Country House is a family-run business, and Louis and Tanja Lategan are looking forward to making your stay in the Klein Karoo an unforgettable experience. 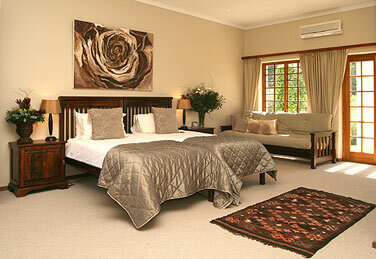 The Thorntree Country House is a private and secure romantic retreat. All our rooms are luxurious, spacious en-suites with air-conditioning and are equipped with TV (M-net and satellite channel), a safe for storing valuables and an honesty bar. The stylish bathrooms are fitted with elegant twin basins. From the saltwater swimming pool, visitors can enjoy unspoilt views of the picturesque Schoemanshoek Valley and relax in the peaceful natural surroundings.